WILTON, Conn. -- Jeff Snyder will do whatever it takes to raise money for pediatric cancer. And if that means dressing in a lemon suit, so be it. The Wilton resident is quick to point out he's not the only one in his community going above and beyond for those they love. Fellow resident Dave Pennino, CEO of LogicSource, also works tirelessly for the cause. As do the folks behind Alex's Lemonade Stand, which his organization, Warriors for a Cure , partnered with in 2013. It's that story that's the focus of a new video by HooplaHa-Only Good News , the Norwalk-based streaming service that focuses on what's good in the world. 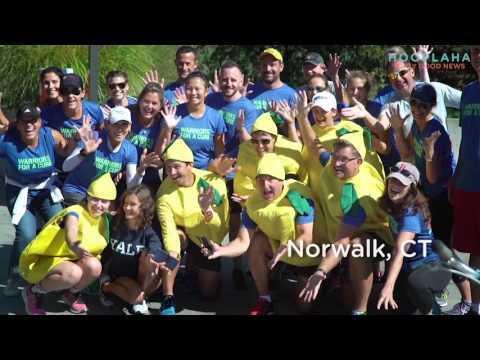 "This Man in a Lemon Suit is Changing Lives" highlights Snyder and his efforts to educate folks about the spinal cord tumor that affected his daughter when she was just 2-years-old. According to the American Cancer Society, "brain and central nervous system tumors are the second most common cancers in children, making up about 26 percent of childhood cancers." With a prognosis of just five years, Kennedy Snyder is now 16 and battling the tumor, while living a normal life as a junior at Wilton High School. Warriors for a Cure has a simple premise: How far would you go to help find a cure for pediatric cancer? Alex’s Lemonade challenged its supporters to pledge one million miles -- walking, running or biking – to help raise awareness for this disease. Warriors For A Cure, which Snyder founded in 2013, has been fortunate enough to maintain the number one fundraising team in the country in the four years since its inception. Pediatric cancer, notes Synder, often gets lumped together with cancer. In reality, he said, it's very different from other adult forms of cancer, and this area is drastically underfunded. The Million Mile Run, Walk, Ride takes place every September to celebrate Pediatric Cancer Awareness Month. This year his organization raised $118,000. And yes, Snyder was the one in a bright yellow lemon costume pausing along the way to take selfies. It was those selfies -- thanks to social media he pledged that for every post shared, he'd donate $20 -- that helped his organization surpass its goal. "It was a win/win because of the social sharing," said Snyder. "More and more people were exposed to the charity, to the challenge and wanted to take part in the movement." And that included kids as young as four and six and adults as old as 60 and beyond. participating "One of the things that's great about the Warriors for a Cure team is the diversity of its members," said Snyder. "Kennedy is still battling her cancer and loves the fact that so many people come out to show their support. "The success of our team really revolves around rallying our community to join together in a unified voice to help find a cure." Go to www.warriorsforacure.com/ for more information.